As registered nurse Tony West considered how to better serve clinical patients in Galette Chambon, Haiti, this missionary determined he and his wife could lessen the suffering of their neighbors if he received further training as a family nurse practitioner. "That would allow me to provide more comprehensive care, including 24-hour and preventive care," said West, who already holds a health services administration master's degree. His dreams also include an inpatient malnutrition center to supplement the medical clinic, dental clinic, orphanage and church now established on the compound housing the Wests' home. About four years ago, the couple moved to the area to help build sustainable communities. They started by meeting basic needs: food, water, shelter. The Wests have since hosted varied missions groups addressing the results of Haiti's 2010 earthquake. With 70 homes built and a thriving Haitian-led church established, the ministry now includes nutrition supplement programs, family garden programs and Bible studies, resulting in untold professions of faith and an influx of 10,000 patients each year who walk up to 10 hours for clinic services. Although many might assume West couldn't find time to further his studies beyond his current four degrees, he believes God called and connected him with Samford faculty who share his Kingdom mission. "When I felt led to go to nurse practitioner school and looked at the online programs, Samford stuck out, because Cyndi Cortes (professor and former clinical coordinator for Samford's Family Nurse Practitioner Program) had come to do a clinic here. The application process was easy, and I've found that I've made the right choice, because the faculty couldn't be more flexible about my situation." West's "situation" involves patience-testing internet and satellite phone challenges. His perseverance, scholarship and more than 30 years of leadership in nursing and Christian witness were recognized through faculty nomination of West for the 2016 Lucille Stewart Beeson Nursing Award. Meanwhile, West is merely grateful for the opportunity to pursue a long-distance Samford degree. "I love Samford. I love that the lectures end with prayer and with scripture. 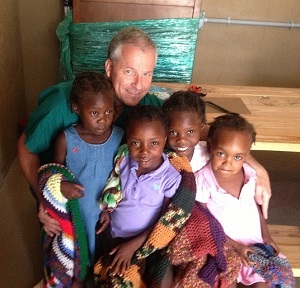 With this degree, I can expand our work with our Haitian physician and nurse, and perhaps do more mobile care. Every day, every patient here has an opportunity to be prayed for and with. They know that we're here to serve them and that we're doing this because God sent us."